Fair warning, this might be my longest post ever! 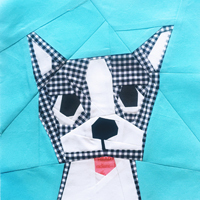 I am so pleased to be kicking off the Patchwork, Please! sew along organized by Lindsey (thank you Lindsey!). Ayumi Takahashi is the author and not only is she a dear friend, she is one of the most inspiring and encouraging people I know. Her book is full of just that. Inspiring, happy, and impeccable projects with superior fabric choices. The first project is Ayumi's bell pepper pepper coaster. I don't use coasters much, so I decided to turn it into a hotpad pattern. I mean come on, a bell pepper hotpad??? So cute!!! So I increased the pattern size by 180% on my printer and got to work. The pattern was super fast and so fun! It's not often that I can make something so cute, fun, and useable in 30-45 minutes. It took me longer to pick the fabrics than it did to sew the pepper up. And here's some exciting news. 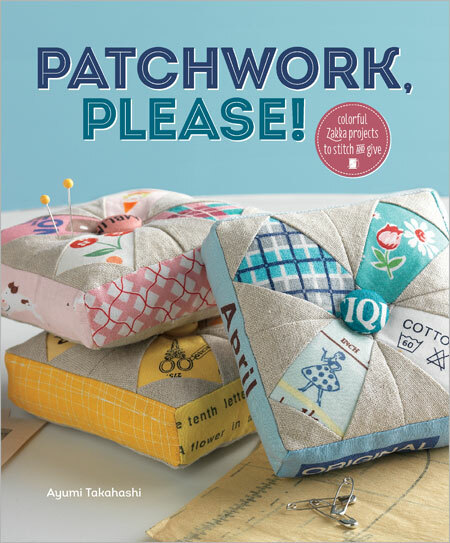 I'm offering up a copy of Patchwork Please! (courtesy of Mama Said Sew! thank you Ange!!! ), 5 sample packs of Aurifil thread, and a sample card of Pellon interfacing and batting. (due to shipping costs, US entries only please). Just leave a comment on this post and I'll pick a winner on Friday. And if that wasn't enough, there's also a giveaway for linking up this weeks project by Sunday June 9th on Lindsey's blog. A $25 GC to Fort Worth Fabric Company and 1 crib size Legacy by Pellon bleached cotton batting. So get sewing!!! Here are the other participants in the Sew Along, and all together we will cover all the projects in the book. And thank you so much for our sponsors for the sew along! I can't wait to see who the lucky winner is!! Oh, I'm the first to speak!. Love the coasters and I'll follow the sew along with great interest. Love the hotpad. Thanks for the give away. Super great idea, love the pattern and also the material used. Makes for a sparkly brite kitchen addition. Love it. What a great idea...I don't use coasters much, but hotpads...hmmn. Think I may be trying this! The hotpad was a great idea! They turned out so cute. Thanks for the great give away. I'd love to tackle some projects from Patchwork Please! Wow, such a cute, cute, cute hot pad and such a generous giveaway. Thank you. I love how you turned the peppers into potholders instead... great idea! Thanks for the opportunity! Super cute hotpad! I'd love to win a copy of the book. I'm still waiting for my library's copy :) And those thread samples actually make me drool a bit, they're so pretty! Ayumi's book and your modifications...What a winning combo! Thanks for such a great review and a lovely giveaway! So cute. Great idea to make hot pads. Would love to win. My book hasn't come yet, boohoo, but it should be here Wednesday. I'm not sure I'd use a coaster, either, but we ALL use hot pads! Great for gifts, too. From the pictures, did you sew all the way WST then turn it? Did you have to trim the batt & insulbright alot to get that sewn edge down? I just love anything Ayumi does and these bell pepper hot pads are no exception ~ yours are too cute! Great idea to enlarge the pattern. I love the large size, too. Thanks for the opportunity to win prizes! Totally love the idea of hot pads! These are adorable! Would love to give Patchwork a whirl. Sometimes picking the fabrics is the hardest part - but it super paid off! I love your finished pot holders! The pepper hot pad is so cute! I can't wait to see the other projects in this book! Thanks for the giveaway! I'd love to win a copy of the book!!! It always takes me a long time to pick my fabric for a project, then I usually end up making several because I find so many great fabrics and can't choose just ONE! What a cute idea. Love the pot holders. Such a darling coaster and neat book! Thanks for the giveaway! So cute! I will be making these! I think I'm going to make the hotpad idea! I wanted to make this for my mother-in-law and like this idea even more than the original! Adorable hot pads! Fun giveaway! what a lovely give away! I can't wait to get my copy of this book! Great hotpad! Thanks for the give-away, my fingers are crossed! I love that you made it into a hot pad, such a great idea! Your fabric choices are so great too! Love the hot pads! Thanks for the chance to win!!! Great idea for my new kitchen! Gotta try it! I'm going to make the hot pads too. What a great idea. 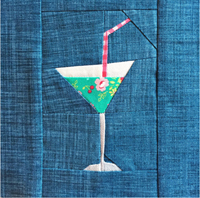 I am so excited about this Sew Along! Thank you for this idea, I'm going with the hot pad idea because we don't use coasters around here much either! Perfect! Thanks for the great idea! THIS IS MY FIRST SEW ALONG AND YEAH THIS IS GOING TO BE FUN! I LOVE THE HOT PAD IDEA...I HAVE TO GO AND GET BUSY! Beautiful hotpads! I would like making them too! Hello from Minnesota! Thanks for the enlarging tips...I've got to get to sewing now. Oh, I love what you did with them! Vegetable hotpads are too adorable. Really like the hotpads. Thanks for the giveaway. Those might be the cutest things I've seen ever!! Thanks for the help and the chance at the giveaway! Oh my gosh, so sweet. Great fabric choices. That book is at the top of my amazon wish list. So my fingers are crossed. Am starting on my coasters today! thanks for the giveaway! Very nice indeed. Who would've thought the humble pepper could look so good! I love Ayumi's style and her designs. I'd love to win all the goodies.